The central figure in the Arab nationalist movement at the time of World War I was Hussein ibn 'Ali, who was appointed by the Turkish Committee of Union and Progress to the position of Sharif of Mecca in 1908. As Sharif, Hussein was responsible for the custody of Islam's shrines in the Hejaz and, consequently, was recognized as one of the Muslims spiritual leaders. 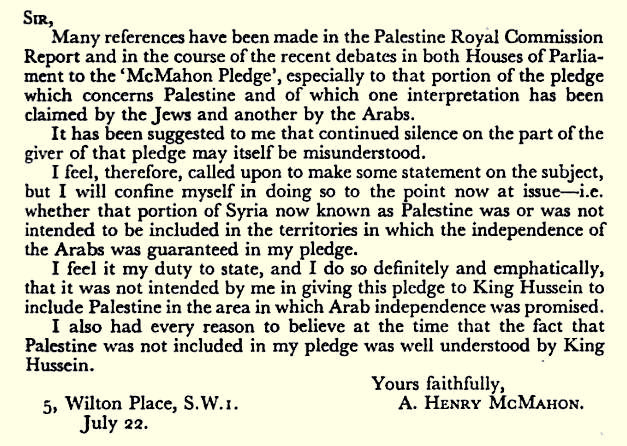 In July 1915, Hussein sent a letter to Sir Henry McMahon, the High Commissioner for Egypt, informing him of the terms for Arab participation in the war against the Turks. Nevertheless, the Arabs held then, as now, that the letters constituted a promise of independence for the Arabs. Sources: 1George Kirk, A Short History of the Middle East, (NY: Frederick Praeger Publishers, 1964), p. 314. 2London Times, (July 23, 1937).